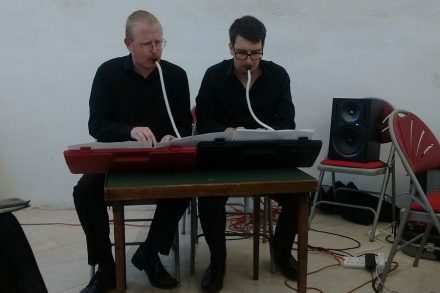 Sheffield-based collective of four composers who share a common desire to explore new ground in contemporary music and to make their individual voices heard. The four composers - Tom James, Tom Owen, Jenny Jackson and Chris Noble - met whilst studying for their postgraduate degrees in composition at the University of Sheffield and latterly formed the composer collective, Platform 4, in 2010. Since their first concert in 2011 they have staged a number of concerts and collaborative events, performing existing works and writing new pieces for traditional concert settings as well as for dance works, music theatre, art installation and opera. They have forged a good relationship with musicians and singers in the local community, composing new works for amateur and professional players, and work closely with Classical Sheffield, Music in the Round and the University of Sheffield music department. Music in the Round commissioned the four Platform 4 composers to each write a new work for their Russia in the Round Festival, inspired by famous Russian repertoire, which were performed by Ensemble 360 in May 2017. Tom James's 'Barn Dance' for wind quintet was recorded and later broadcast on BBC Radio 3 Listen. You can watch past performances on our YouTube channel Watch or Listen to audio recordings on our SoundCloud. Please visit the website for more information and to keep up-to-date, or 'like' the Facebook page, or follow us on Twitter! We would love to hear from you if are interested in a collaboration or if you would like to commission new work. Email Platform4@live.co.uk.